Be the first to share your favorite memory, photo or story of Gwinda. This memorial page is dedicated for family, friends and future generations to celebrate the life of their loved one. 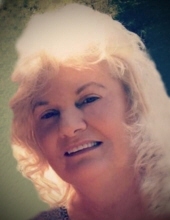 Gwinda “Sue” Hughes age 69 wife of Roger L. Hughes of Bevinsville passed away from this life Monday April 8th, 2019 at Highlands Regional Medical Center in Prestonsburg, Kentucky. Sue was born on August 27th, 1949 in Floyd County a daughter of the late Woodrow and Veedas Cook Burke. She was a secretary for Isaac Insurance company. Along with her husband she is survived by: one daughter: Charlie Ann Bartley of Bevinsville; two grandchildren: Cody Lee (Nikki) Bartley and Casey Dean (AJ) Hamilton; and two brothers: Randall Dean (Nancy) Burke of Martin and Jack Price Burke of Bevinsville. Including her parents she is preceded in death by one sister: Flotina Burke and one sister in-law: Janet Burke. "Email Address" would like to share the life celebration of Gwinda "Sue" Hughes. Click on the "link" to go to share a favorite memory or leave a condolence message for the family.